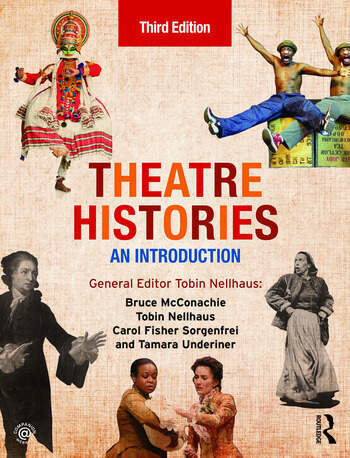 This thoroughly revised and updated third edition of the innovative and widely acclaimed Theatre Histories: An Introduction offers a critical overview of global theatre and drama, spanning a broad wealth of world cultures and periods. Bringing together a group of scholars from a diverse range of backgrounds to add fresh perspectives on the history of global theatre, the book illustrates historiographical theories with case studies demonstrating various methods and interpretive approaches. A new and updated companion website with further insights, activities and resources to enable students to further their knowledge and understanding of the theatre. Tobin Nellhaus is an independent scholar and former Librarian for Performing Arts, Media and Philosophy at Yale University. He writes mainly on the relationship between theatre and communication practices, and on critical realism in theatre historiography. Bruce McConachie is Chair of Theatre Arts at the University of Pittsburgh, where he also directs and performs. He has published widely in American theatre history, theatre historiography, and performance and cognitive studies, and is a former President of the American Society for Theatre Research. Carol Fisher Sorgenfrei is Professor Emerita of Theatre and Performance Studies and former Vice Chair for Graduate Programs at UCLA and former Research Fellow in the Institute for Theatre Studies at Berlin's Free University. She is a scholar, translator, playwright, and director focusing on Japanese and cross-cultural theatre. Tamara Underiner is Associate Dean for Research for the Herberger Institute for Design and the Arts at Arizona State University, and director of the Ph.D. program in Theatre and Performance of the Americas.